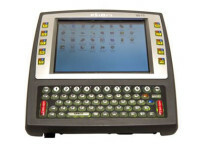 The 8585 and 8595 are the latest rugged vehicle mount computers from Psion that have been designed and built for the tough demands of such environments as warehouses, ports, manufacturing plants and airports. 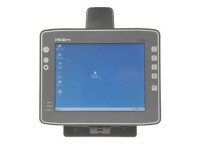 These rugged vehicle mount computers are compact and still provide full PC functionality with a Windows® XP or Windows® 7 operating system. Thus, the 8585 and 8595 ensure your workers are equipped with the tools they need to get the job done efficiently and effectively. The 8585 and 8595 take up very little space. Their thin design make it simple to mount wherever space is available in your vehicle. 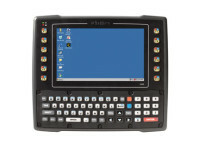 Once mounted, the compact dimensions of the 8585 and 8595 ensure your workers have access to their computer when needed without it gettting in the way while performing other tasks. Built with the Intel Atom® processor, the 8585 and 8595 consume minimal power, but still operate quickly due to their 1.1 GHz processor speed. 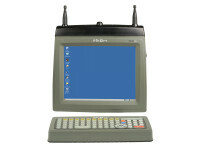 Even in demanding WLAN networks, the 8585 and 8595 ensure that you are always connected with the rest of the team. Featuring an integrated diversity-antenna space diversity and 802.11 a/b/g/n WLAN, the 8585 and 8595 provide reliable communication and fast throughput. The 8585 and 8595 have been tested on strict Standards for shock and vibration. Their IP66 and IP67 rating means they are protected against vibration, dust and other impacts. Whether mounted to non-suspension vehicles or machines with substantial imbalances, the 8585 and 8595 will keep providing workers the support they need. * Note this product will carry the CE Mark. The 8585 / 8595 offer multiple keyboards to users including the colour option with 72 keys and the 82-key option with integrated backlighting. A wide range of mounting options ensures that you get the right fit for your particular application.